Recently I submitted my frist puzzle game Directional for my Mental Challenge project in my GAT250 (2D Game Design 1) class. I had 5 weeks to make this project from start to end. 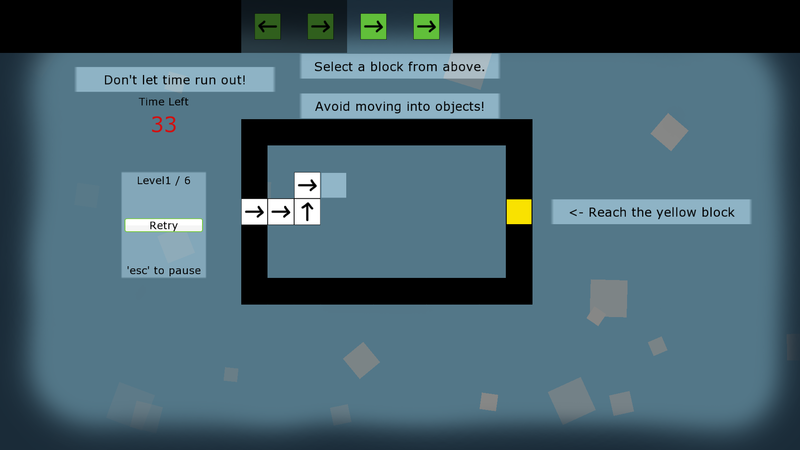 Although the resulting game was simple, I learned so much from my first attempt at making a puzzle game. Download and try the game here if you haven’t done so already. What is a Mental Challenge game? A mental challenge game is a game who’s primary focus is to make the player think. While most games have mental challenge mixed in along with other forms of engagement, this project challenged us to make a game who’s primary engagement was mental challenge. So the primary goal of the game was to make the player think and from there have them feel smart for overcoming the challenge you put before them. Due to limited time, I had to come up with an idea fast and get something up and running as soon as possible. I went through a few ideas but by the end of the week I had a game where the player would pick from a selection of directional tiles and tried to make his way to the yellow tile. This was a simple idea that was scoped appropriately for the 3-4 remaining weeks. Before the game seen in the image above, the player was able to choose from 5 different tiles (as opposed to 2). The tiles could not be random because there would be no way of guaranteeing that there would be a path to the goal, so they had to be predetermined. This meant that I needed to make sure that the player was going to have exactly what they needed when they needed it, which resulted in a dull experience. To try and fix this I reduced the amount of selection the player had while still giving them a preview of the two upcoming tiles to allow them to plan ahead. This helped solve part of the problem because it meant that the player had less resources to work with, resulting in a more calculated use of tiles. However, the problem still remained that the player had exactly what they needed, when they needed it. From this problem emerged one of the most prominent mechanics: storing tiles. 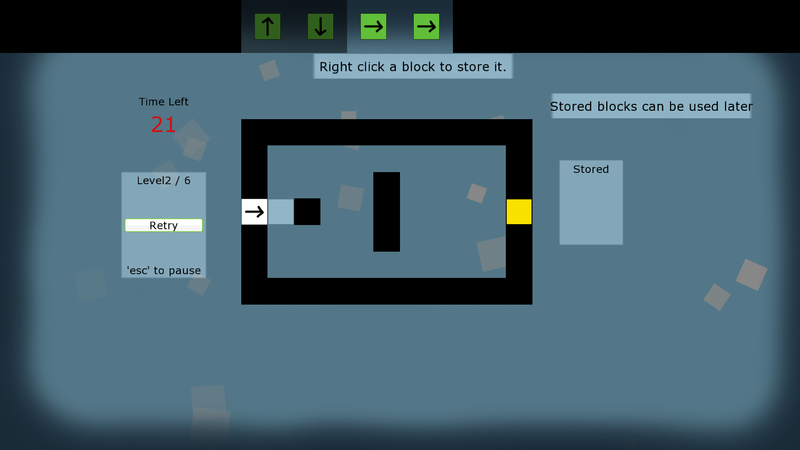 Giving the player the ability to store one tile for future use was a positive addition to the game. This mechanic allowed me to not always give the player the correct tiles at the right time, and puts them in a situation where they have to decide which tiles they want to save for later and which they want to use now. This solved the big design problem I was dealing with and as a result the player felt smart when they figured out when to use and when to store tiles. Going through this process taught me an important lesson about puzzle games. Giving the player different tools to interact with existing resources increased my opportunities as a designer to create interesting challenges. This sounds simple, but in practice it is easily forgotten and is a useful thing to keep in mind. The more tools the player is given to interact with the resources in the environment, the more opportunities you will have to make interesting challenges. At the start, this game only gave the player one way to interact with the puzzle: select a tile. I tried adding additional mechanics to the environment like gates and switches, but they did not make the game much more interesting because they rarely changed the interactions the player had with the game. Adding the store tile mechanic gave the player more tools and therefor increased the opportunity to create rewarding challenge in the game.